I published the 4th article of “Faces of Waves Illustrated”, my online free textbook of the trading strategy based on Elliott wave principle. This is my first draft, and I have already found lots places to improve my writing, but I will hold any revision work until I finish writing to the last article on this series because to finish writing the first draft requires passion and momentum. Anyhow, I traded 3 times in January. 0.25% x 0.26% x 7.91% = 8.5% (1.0025 x 1.0026 x 1.0791 – 1.00 = 0.0846… = 8.5%) return. No loss cut. Very efficient. I like it. Thus my January trade ended happily. 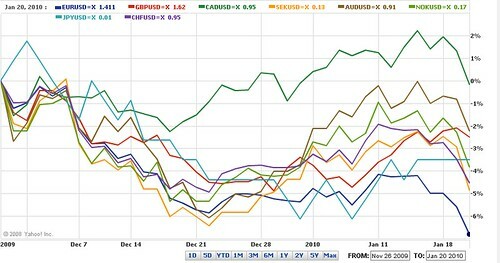 What I did not anticipate well is EURUSD sank another 350pips after I had exited the market. Maybe I was a bit too selective. 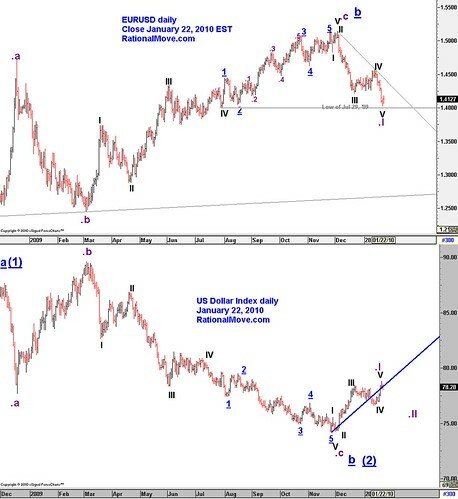 But this does not change my mid & long term outlook on EURUSD. I completely existed from my short position on January 19 at 1.4200. It was when the price was between the blue underlined 2 and 3. At that time, what we see now as blue underlined 2 seemed to be 4th wave. 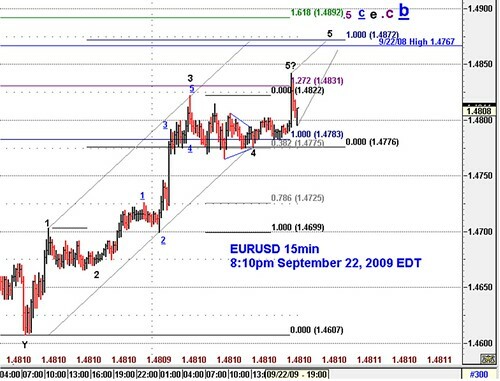 But EURUSD had some more way to go down, so I corrected my Elliott wave count. 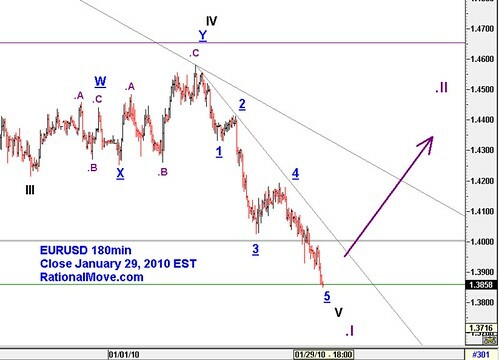 The blue underline 4 wave with the current count may have been a good re-entry point, and this could have brought me another 100pips at least. But I do not regret too much about it, because the blue underlined 5 wave did not descend as smoothly as Wave 3. This kind of sluggish move (ending diagonal) often confuses traders, and it’s just exhaust my energy. It is always a good idea to trade only when risk and reward are defined clearly. One more rule is to trade only when one can anticipate a smooth ride if you care about your mental health! 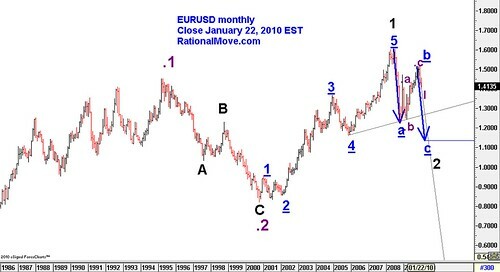 By Elliott principle and the current wave count, I am anticipating Euro to rebound in the next week towards 1.4650 (purple .II). Wave 2 is often a zigzag up. That is a (impulse 5 wave up)- b(corrective 3 wave down), and c(impulse 5 wave up). But it could be flat that is a(3)-b(3)-c(5). Or complex (W-X-Y…). So I will pass the first two (i.e. 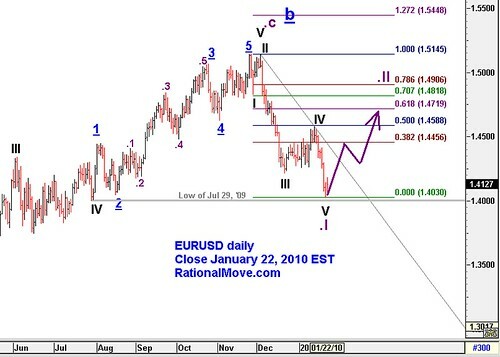 A and B) waves and plan to long EURUSD on Wave C if we start to see purple .II. If you are new, check the introduction and table of contents first. The first wave pattern I describe in details is impulse wave. Fortunately, this is the most important wave pattern we learn. It also have the most distinct shape, so we can easily identify. Anatomy: How does it look like? What is the subwave structures. When does it appear? How to anticipate the next impulse wave? 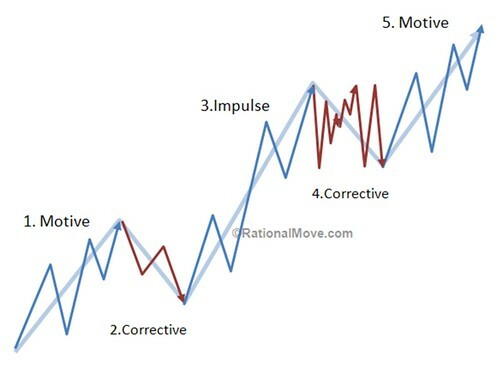 What is the trading strategy over impulse waves? Using Fibonacci (golden ratio) to estimate the potential profit. Variation in the impulse structure: extension & truncation. Probably, it would take three articles to finish presenting all the materials above. 1. Anatomy: How does it look like? What is the subwave structures. Wave 3 must not be the shortest among 1, 3 and 5 waves. Wave 4′s end point must not cross Wave 1′s end point. In other words, Waves 1 and 4 never overlaps in the price range. Wave 1 must be a motive wave, and it can be diagonal or impulse. Appearance of a diagonal wave is rather rare here. Wave 2 must be a corrective wave. 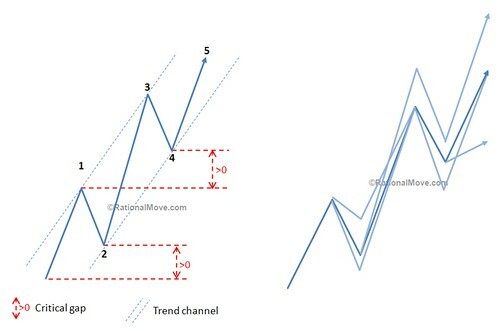 A zigzag wave frequently appears in Wave 2, but it could be other corrective wave. Wave 3 must be an impulse wave. Wave 4 must be a corrective wave. We often observe a complex wave. Wave 5 must be a motive wave. Either impulse or diagonal. Often we see a diagonal wave here. Wave 1: The bull market is emerging under the surface, but most people are still skeptical of the economy and desperate. Wave 2: A zigzag but deep pull back falsely convince people of the continuation of the bear market. But it is actually the phase that the market charges energy for the strong bull market. Wave 3: All of a sudden, the market gains upward momentum, and it only accelerates. The emergence of the bull market is now obvious to everybody. Wave 4: Profit taking. The fortunate people who entered the market early enough start to cash out (sell). But there are still plenty of buyers, and the market goes sideways as a result of the tug of war between buyers and sellers. So when we count the waves, we have to be careful not to break those rules. 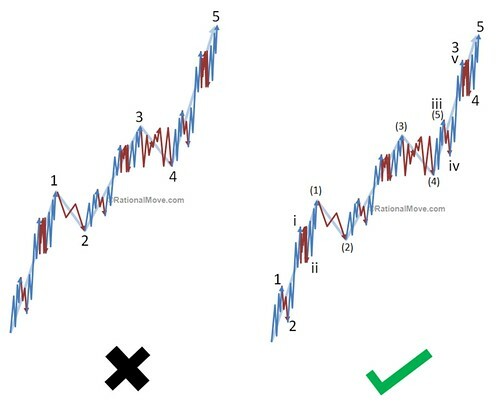 In the example below, the wave count on the left is incorrect because Wave 3 is the shortest. The right one is the same wave as the left, but with the correct wave count. Notice the use of subwave counts that makes Wave 3 itself an impulse. This agrees well with the rule No.2.